Site Tours: Meet in Best Western Motel Lobby at 9:00 a.m. Tour Cross L, Evan’s 1868 Military Supply Depot, Archie King I, Chill Hill, M-Cross Ranch, Buried City, and Historic Kiowa Villages along Wolf Creek. Return at 4:00 p.m. Sack lunch provided. Reception: 4:00 p.m.-7:00 p.m. The Lobo Restaurant, Lake Fryer County Park, Perryton. Hors d’oeuvres and free beer will be provided. Click for Map of Location. 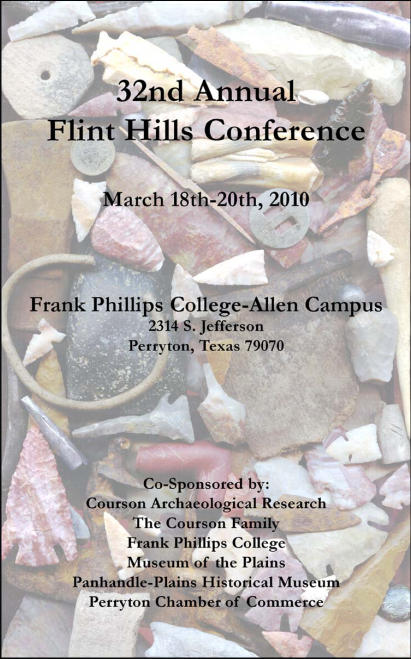 5:00 p.m.-7:00 p.m.: Reception at Courson Archaeological Research Lab, 133307 US Hwy 83, Perryton, TX. 7:00 p.m.-9:00 p.m.: Dinner at the Museum of the Plains, 1200 N. Main, Perryton. Dinner will be catered by Dyer’s Barbecue of Pampa, TX. Free beer will be provided. Click for Map of Location. 9:00 a.m.-1:00 p.m.: Meet in Best Western Motel Lobby at 9:00 a.m. Tour Alibates Flint Quarries National Monument outside of Fritch, TX. Click for directions. 1:00 p.m.-2:00 p.m.: Lunch at the Big Texan, 7701 E. Interstate 40, Amarillo, TX. Click for Map of Location. 2:00 p.m.-4:00 p.m.: Tour Panhandle Plains Historical Museum, Canyon, TX. Click for Map of Location. Return to Perryton at 6:00 p.m.